Savoury Parmesan, olives, Italian dressing and fresh vegetables bring Mediterranean flavour to this easy yet impressive pasta salad. 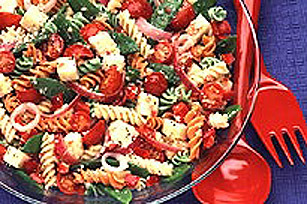 Make this pasta salad ahead for effortless entertaining. COMBINE pasta, vegetables, olives, salad dressing and cheese.